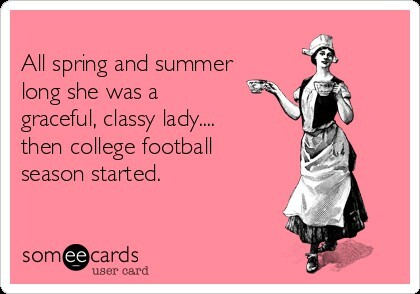 Most days, I aim to be a sweet and charming gentlewoman of the South, but when game day comes around, all bets are off. As many of you already know, last week Alabama (ranked #1) and Clemson (#2) faced off at the College Football National Championship. Both teams came in undefeated, but our quarterback threw two interceptions and Clemson…well, let’s just say I feel no need to share the final score. I was hot, and bothered, and upset, and I had no idea what to do with myself except for prep for next season. In the South, we’re all about traditions, and we take them very seriously. Seriously. Southern belles and the SEC. – it’s a thing. If you’re a southern woman, there are some things only you and your fellow GRITS (Girls Raised In The South) truly understand – like how sweet tea belongs in Mason jars, grits need cheese, and not all barbecue is made equally. Most likely, you grew up wearing team colors on Friday. And, whether it’s your college alma mater, your husband’s team, or your kid’s school of choice, you cheer like there’s no tomorrow. Bonafide GRITS understand that dressing up for the game is a ritual in itself: sundresses in team colors, feminine face paint (yep, it’s also a thing), and the heels to match. Football is where you take your best friend to set her up with that guy you know; tailgating is what you talk about all week; and the side dish you bring to game day says a whole lot about you (read: real women love cream cheese). As it turns out, this isn’t just our unwritten culture–there’s an actual science to the southern belle and SEC phenomenon, and professors at University of Georgia are trying to figure it out. They believe that dressing up for football games is both a pleasure and a duty, an extension of the expectations for a traditional southern lady. I say that’s a little too watered down. Maybe they should have read the 5-star Southern Girls College Football Guide by Charlsa Taul Perdew, a small-town girl who wrote a blog and led workshops to teach women about the game and empower them to better enjoy the tradition. For Perdew and me, the SEC is about connecting with family and friends, feeling like you’re a part of something bigger than yourself, and the love of football. We dress up because we respect and love our community, our team, and the game – not just because it’s expected of us. My beloved Alabama may have lost the battle, but we’ll be back to continue fighting the war. This is my tradition, and Crimson Tide will always be number one in my heart no matter the final score. Roll Tide!